Allen Organs are built at the Allen factory in Macungie, PA, about an hour outside of Philadelphia. As of 2017, no other major digital organ company continues to build organs in the United States except for Allen. Rather than using particle board and angle brackets, Allen Organ consoles are assembled using proven woodworking techniques, such as wood on wood doweled-construction and superior structural design. The factory also houses Allen Integrated Assemblies, where digital components are manufactured. Allen Organ Company is so committed to the quality of manufacturing that they produce every component internally, down to the individual circuit boards and cages within the organ. See the difference for yourself. Stop by our showroom and we'll be glad to walk you through the construction of an Allen Organ. 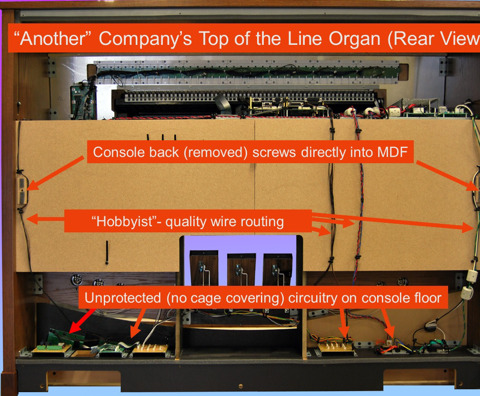 Take a look at another company's organ, below. Note by Note/Individual Stop Voicing Controls - No other digital organ manufacturer allows complete flexibility with voicing like Allen does. This allows us to match the organ to the environment in which it is placed. Expanded Audio - Every Chancel or Bravura organ can be configured to work with expanded and even interlaced audio. By splitting the C and C# into separate speakers, true pipe acoustics can be recreated in your space. Interlaced audio takes it to the next level, by eliminating phase disruption for specific harmonies sounding through the same speakers. GeniSys Voices - Now you can add warm, rich symphonic sounds and additional organ stops to your Allen Organ with GeniSys Voices. GeniSys Voices is the next evolution in MIDI technology for the organ and adds these voices to each manual as traditional stops, allowing you to use them like any other sound in the organ. Thoughtful and Customizable Stop Lists - Historique and Chancel organs draw on 500 years of organ builders' experiences. The stoplists they feature showcase the most common and desirable registrations from classic organs around the world. Bravura organs also share these thoughtful stoplists, and clients can customize and/or add any stops they desire. Allen Organs stand out as organists' favorite digital organ and have proven their lasting quality. We would be honored to walk through the organ selection process with you. If you'd like more information, please fill out the form below and we'll be glad to contact you as soon as possible.